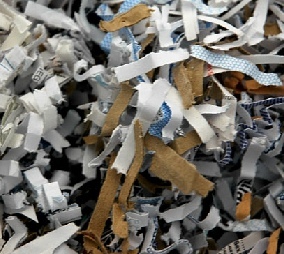 ﻿ Shred Assured Palm Beach Florida Secure Mobile On Site and Off Site Document Destruction and Paper Shredding Service - Laws and Regulations Regarding Paper Shredding, Data Destruction, Computer Destruction, Disposal and Recycling. Could you r company survive a lawsuit? Various state, federal and international regulations govern the protection of private information. Disclosing private information — even by accident — could be grounds for a lawsuit. 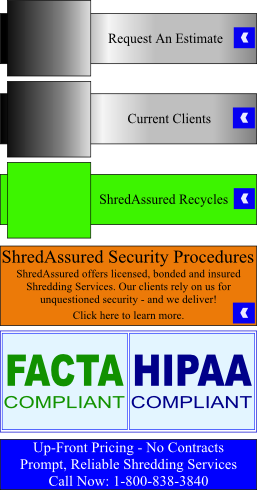 A secure, reliable shredding program will assist you in remaining legally compliant with privacy laws. The following is an overview of the three main Federal laws and regulations that companies and organizations must be in compliance with. At ShredAssured, we stay abreast of these ever changing laws and how they affect the Data Destruction industry. You can count on us to protect your privacy and always keep you in compliance with them. Signed into federal law in 1996, HIPAA was created to combat fraud and abuse in the health insurance industry. The Act stipulates that all United States health care organizations must "maintain reasonable and appropriate, technical, and physical safeguards to prevent intentional or unintentional use or disclosure of protected health information." The following are brief descriptions for some of the other many laws and regulations that companies and organizations must be in compliance with. At ShredAssured, we stay abreast of all these ever changing laws and how they affect the Data Destruction industry. You can count on us to protect your privacy and always keep you in compliance. • The 1974 Federal Privacy Act was established to insure that government agencies protect the privacy of individuals and businesses with regard to information held by them and to hold these agencies liable if any information is released without authorization. • Securities Exchange Commission (SEC) — Regulation S-P: The purpose of this Regulation is to bring businesses regulated by the SEC into compliance with the concepts for privacy outlined under the GLB Act. This Act applies to broker-dealers, funds, registered advisors, those who deal with variable annuity or variable life insurance, and any other entities dealing in Securities. • Safe Harbor Privacy Principles: In October 1998, the European Union’s wide-sweeping privacy legislation — called the European Union Data Protection Directive — became effective. The Directive places new requirements on businesses that wish to collect, process or transfer personal data from an EU Member State to an non-EU Member State. Under the Directive, the transfer of personal information from an EU Member State to a non-EU country is forbidden unless the country and the company involved provide an “adequate” level of privacy protection. • FERMA exists to widen and raise the culture of Risk Management throughout Europe to its members and to the risk management and insurance community. It achieves its aims by promotion and raising awareness of risk management through the media, by information sharing, educational and research projects. • Sarbanes Oxley Act (2002) was passed to implement changes in federal securities regulation, corporate governance, and the regulation or auditors. It expanded federal white-collar laws criminalizing the destruction of certain corporate communications and documents. • Federal Rule 26: By not adhering to a program of routinely destroying stored records, a company exhibits suspicious disposal practices that could be negatively construed in the event of litigation or audit. Destroying on a set schedule limits your legal risks. 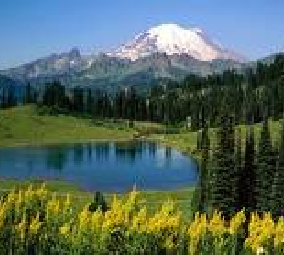 • FERPA is a Federal law that protects the privacy of student education records. 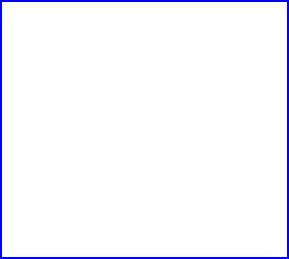 The law applies to all schools that receive funds under an applicable program of the U.S. Department of Education. FERPA gives parents certain rights with respect to their children's education records. These rights transfer to the student when he or she reaches the age of 18 or attends a school beyond the high school level. • Fair Credit Reporting: Enforced by the Federal Trade Commission, is designed to promote accuracy and ensure the privacy of the information used in consumer reports. Recent amendments to the Act expand your rights and place additional requirements on Consumer Reporting Agencies. Businesses that supply information about you to Consumer Reporting Agencies and those that use consumer reports also have new responsibilities under the law. • Economic Espionage Act makes the theft or misappropriation of trade secrets a criminal offense, and is the first federal law that purports to both broadly define and severely punish such misappropriation and theft. ShredAssured provides security and consulting services that keep your company in compliance with all mandated State and Federal laws pertaining to document destruction, thus allowing your company to be confident all regulations are being administered. For more information, give us a call at 1-800-838-3840 to find out how ShredAssured can help your company save money, protect its information, and comply with federal and state laws. Our client specialists are ready to assist and willing to help in any way they can.